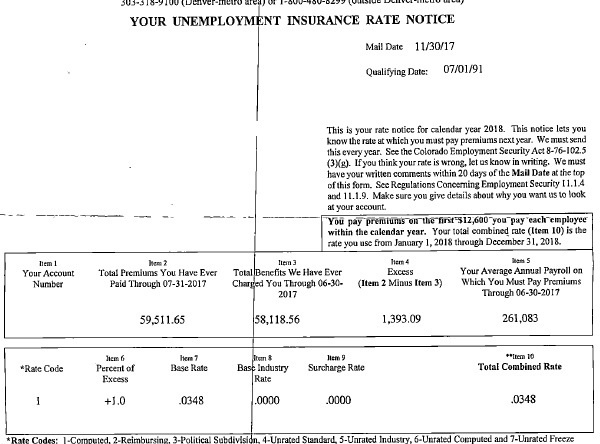 Unemployment Insurance (UI) Rate Notice: Employer UI rates in Colorado will be mailed to your address on file with the Colorado Department of Labor & Employment (CO-DOL) each November for the following year. They typically arrive around Thanksgiving week. New employers should receive their rate notices shortly after their account has been established. What if I can't locate my UI Rate Notice? If we do not get a copy of your UI Rate notice, we will create an adjusting payroll entry once the rate has been updated which will collect or return the variance. We are able to get a master list of rates from the state by mid/late-January. How do I contact Colorado Department of Labor? You can call the UI Employers Services line at the CO-DOL at (303) 318-9100 or toll-free at 1-800-480-8299 (option #3). If you have your UI account number, they will supply you with your UI rate over the phone. You may want to verify your address on file as well. How do I locate my UI account number? You can locate your UI account number on any of the tax liability reports we send with each payroll or from a copy of any of the UITR's we have saved in your Client Portal. Why didn't I get the letter in the mail? The CO-DOL mails the UI Rate Notice to your address on file with the agency. Perhaps the mailing address on file with the CO-DOL needs to be updated. Click Here to complete an address updated online or via paper form.